"The life of an aviator seemed to me ideal. It involved skill. It brought adventure. It made use of the latest developments of science. Mechanical engineers were fettered to factories and drafting boards while pilots have the freedom of wind with the expanse of sky. There were times in an aeroplane when it seemed I had escaped mortality to look down on earth like a God." -Born February 4, 1902 in Detroit, Michigan, Charles Lindbergh was to become the world’s most famous aviator. -Lindbergh’s father was a U.S. Congressman, and Lindbergh spent an unhappy childhood moving between his beloved home in Little Falls, Minnesota, to his mother’s family residence in Detroit, to boarding houses in Washington, D.C.
-Briefly attending college in Madison, Wisconsin in the early 1920s with poor academic results, Lindbergh moved to Nebraska to gain some experience in aviation. -In 1923, with financial help from his father, Lindbergh bought a World War I surplus Curtiss JN-4 Jenny which he used for a barnstorming tour around the Midwest. This Jenny is currently in the museum's collection. -Seeing the Army Air Service as a means through which he could serve his country and gain experience with more advanced aircraft, Lindbergh enlisted. He graduated first in his class and in 1925 was commissioned as a 2nd lieutenant in the Army Air Service Reserve Corps. -Lindbergh gained further experience flying the airmail route from St. Louis to Chicago in all types of weather under primitive conditions. It was during his time a s an airmail pilot that Lindbergh seized upon the idea of competing for the Orteig prize of $25,000 for the first flight from New York to Paris. -When Lindbergh landed The Spirit of St. Louis in Paris after flying for 33 hours and 30 minutes even the massive crowds awaiting him did not prepare him for the public adulation which followed his flight. The media attention focused on Lindbergh was a wholly new phenomenon and he was to find that his life would never be fully private again. -Lindbergh followed his historic flight with a goodwill tour of the 48 states, sponsored by Long Islander Harry Guggenheim. His continued popularity contributed greatly to the popularity of aviation in general—1927 saw a 300% increase in the number of applicants for pilot’s licenses in the US and an increase of more than 400% in the number of licensed aircraft. The number of American landing fields and airports would double within the next three years. -Lindbergh believed that the most important role he could fulfill was the promotion of commercial aviation. To that end, he decided to help develop a transcontinental airline service. Working as a consultant for Transcontinental Air Transport (TAT) and PanAmerican Airways, Lindbergh flew survey flights for the development of passenger and airmail routes. -In May of 1929, after only a few dates, Lindbergh married Anne Morrow. They would have six children together. Anne was to become an accomplished author in her own right with many bestselling books. -Lindbergh was the first to see the importance of Robert Goddard’s experiments with rocketry and helped to get his friend Harry Guggenheim to fund his research. -Lindbergh became close friends with Nobel laureate, Dr. Alexis Carrel. Working together, they developed a perfusion pump which is the predecessor to the modern artificial heart. -In 1931, in a Lockheed Sirius, Charles and Anne Morrow Lindbergh embarked on a survey flight of the Great Circle route over Northern Canada, Alaska, and Siberia and then down to Japan and China. 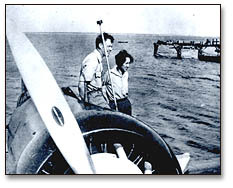 Anne acted a co-pilot, navigator, and radio operator on their flights. This was just the first of many such survey flights which they would undertake over the years. -In March of 1932, a tragedy struck the Lindberghs which was to haunt them for the rest of their lives. Their 20 month old son, Charles A. Lindbergh, Jr. was kidnapped from their home. Two months later the child’s corpse was found buried in the woods not four miles from their house. It was not until two years later that an arrest and conviction was finally made in the case. -Fleeing the heightened public scrutiny which followed the death of their baby and fearing for life of their second child, Jon, the Lindberghs fled to Europe were they found some temporary peace. The coming European War would however quickly put an end to this period of tranquility. At the request of the American government, Lindbergh made tours of German aircraft factories in 1936 and 1938. He provided valuable information to the United States on German air power but he also developed an admiration for the energy and enthusiasm which had infused Germany since Hitler’s rise to power. 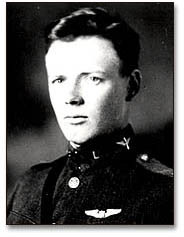 Upon return ing to the United States, Lindbergh became a spokesman for America First an organization which preached non-intervention in the European War. Lindbergh’s main goal was keeping America out of the war, allowing the fascist and communist states to fight each other. His speeches, however, were anti-Semitic and combined with his early praise of Germany branded him as traitor to many Americans. During this period, Lindbergh lived on Lloyd’s Neck, just North of Huntington. After the attack on Pearl Harbor, Lindbergh wholeheartedly joined in the war effort. During World War II, Lindbergh served as a test pilot in private industry and engaged in several combat missions in the South Pacific. In his later life, Lindbergh dedicated himself to the preservation of wildlife, the environment and native peoples. In 1974, knowing he was near death from cancer, Lindbergh determined to die in his own way, returned to his favorite place in Hawaii and there with his family gathered around him he died on August 26th.